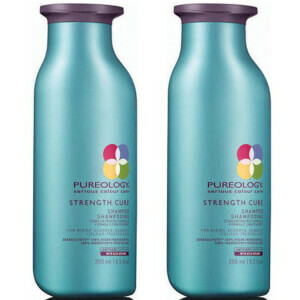 Boasting an opulent formula, Pureology Strength Cure Conditioner instantly detangles and conditions while strengthening damaged hair. With its focus to improve hair's shine and softness, this product is the ultimate conditioner to protect your hair. My hairdresser recommended this to me along along the the pureology hydrate shampoo After using it just a couple of times my hair feels amazing. Would definitely recommend! 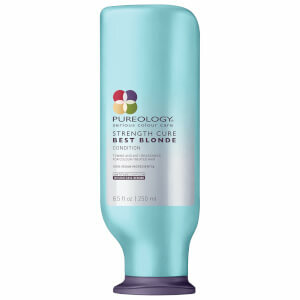 Bought the pureology shampoo and conditioner, bought the purple ones before. Thought I'd try a different one in the same range, very good, would recommend. This is brilliant conditioner as only a small amount makes hair silky and easy to comb...however it was so badly packaged that almost half the bottle contents were all over the inside of the package. Very disappointed as I contacted look fantastic and sent in photos to which I have had no reply! Don't buy from them agai . I used this shampoo because I always struggle to get my hair to grow. My hairdresser told me that Strength Cure would help my get stronger and stop breaking. And it worked. Now my hair is longer and I see less hair breaking off every time I brush it. I used to use Moroccan oil Shampoo and Conditioner which I also love. However, I now colour my hair and needed something that was good for the hair as well as protecting the colour. 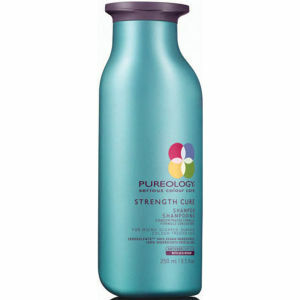 I tried Pureology Strength Cure Conditioner and Shampoo and I'm in love. I have bought it three times since and will continue to do so! It leaves your hair feeling silky and hydrated. I frequently use heat on my hair and get split ends quite easily but I have noticed a reduction in split ends since using this shampoo & conditioner. Of course, we do all eventually get split ends when we are due a hair cut but you'll need a cut far less with this Shampoo & Conditioner! Very pleased and I have recommended it to two friends who both now use it too :). This product may have done excellent things to my hair but the smell was so offputting that I will not want to buy it again - and am having serious trouble using the shampoo and conditionner that I have already bought. Surely for this price, they could have made it smell at least tolerable? Oh dear! Didn't realise the shampoo was for coloured hair as mine is not. Even so, my hair has felt stronger, thicker and easy to manage. I have ordered a different range this time. I would definitely recommend. This is a great conditioner for damaged hair. My hair has been abused by bleaching, permanent color and by aggressive heat styling. It was weak and I had some breakage in addition to some serious dryness. I was considering cutting several inches off as a last resort. My colorist recommended Strength Cure so I decided to try it. I used it for about a month and my breakage stopped completely. My hair was stronger thanks to the protein and my dryness was also totally cured. My hair now looks and feels very healthy and is strong and shiny. I've been using Strength Cure for about a year and I really like the way my hair behaves when I use it (and the shampoo). I haven't stopped the abuse but my tresses look like virgin hair and even my colorist has noticed a huge difference. These products smell amazing and leave my hair feeling soft and nourished. Nothing else I've ever used has worked as well. They never strip my precious color and they make my hair amenable to styling. I have a whole new head of hair thanks to Strength Cure. I highly recommend it for weak, dry, damaged hair.